We are over halfway through the year. Before I tell you about my recent life-changing-hideous-failure-induced epiphany, how’s those New Year’s resolutions going? If you’d like some hints on setting smarter, easier goals, you can read the Next magazine article here. I forgot my handcuffs. And my police notebook. And my pen. I didn’t know the call sign of my patrol car. And then I woke up. Wow. Nasty dream. So that old painful stuff was very much alive and well. That’s my version of my second deepest fear – that I’m incompetent. (My very deepest fear is the same as yours – being eaten by a sabertooth tiger. That is, after my tribe has guessed my guilty secret that I’m incompetent and cast me from the tribal cave). I was in the police, several lifetimes ago. Your second deepest fear may manifest in the type of dream where you are sitting an exam naked, or rushing to an important meeting you never get to, or trying to prevent an unpreventable disaster. I managed to find such a paragon of an Amazon employee. But it was touch and go that a minor publishing disaster was averted. And a teeny bit stressful on top of already feeling terrible about needing to cancel the book release. And I was feeling terrible. After realizing I needed to cancel my book release, but before my I’ve-incompetently-forgotten-everything-I need-to-do-my-job-as-a-police-officer nightmare, I realized the critical voices were back. The voices of all the people who’ve ever said or implied that I’m not good enough, that I’m an incompetent failure. All the voices that I’ve internalized. So while it’s been a long time since I had a dream like that, it wasn’t a complete surprise. The thing is, cancelling my book publication was a big deal. It’s not the first time I’ve postponed publication and, frankly, it’s really embarrassing. However, this cancellation was a bigger deal than ‘mere’ embarrassment of yet another pushed-out deadline. This publication had ‘pre-orders’ set up on Amazon (meaning the book was available for pre-order before publication and release). The publication cancellation meant all existing book pre-orders were also cancelled. You may have received a ‘pre-order cancellation’ notice from Amazon. I don’t know how many pre-orders were cancelled. I didn’t look at the numbers. It was too awful. And I’d set-up a whole lot of marketing infrastructure around the book being released in July. There was plenty of media interest in my book (which was reassuring) and a bunch of interviews – including the Next magazine article mentioned at the start of this newsletter. You’ll see my non-existent book referred to in the article. So all that marketing momentum was lost. And I still didn’t (and don’t) have a finished book. Fortunately I’ve been around long enough to realize that things often have a funny way of working out – albeit not in the ways we were expecting nor on the timelines we were hoping for. The morning after the police dream I fought back. I got curious. Where’s the damn silver lining!? Having to cancel my book release bought up lots of still festering stuff. Okay. Where were the gifts of this unpleasant event – or at least the lessons? 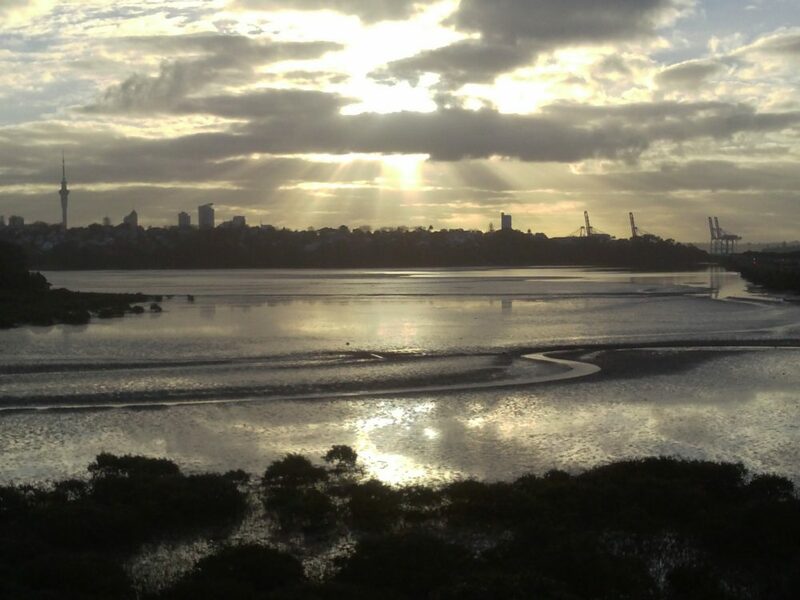 Where was the silver lining? This old soul-pain stuff had been lured to the surface by my failure. Great! Now what the hell was I supposed to do with it? That’s when the epiphany hit me. If that old painful stuff was anyone else’s old painful stuff, I’d know exactly what to do with it. And, demonstrably, I knew how to do that. For other people. In 15 years of years of helping Lifeline callers, struggling students and many other people; I’ve eased pain, soothed anxiety attacks, validated people’s strengths, fears, and Selves, helped them stop procrastinating and start finishing, and given them reasons to live (although I couldn’t do that for my uncle). I know how to help others with their old deep pain. Yet I wasn’t helping myself with my own. Growing up with too much rejection and criticism can, unsurprisingly, have perverse effects. I’ve realized that like many in the ‘helping professions’ I found acceptance and self-worth in helping others. When we get a million messages that we aren’t good enough, when we do find something we are unarguably good at, it’s so tempting to clutch that thing like a drowning man clutches a life-ring. The life-sized problem is that this type of self-worth is conditional self-worth, akin to debunked self-esteem. And our self-worth is conditional on ‘the helping’ being uni-directional. It’s conditional on us not being a bother, not inconveniencing anyone else, on not being weak, on being the strong one. On not receiving help, from anyone. It’s all about the giving. And giving. And giving. Always needing to be strong makes us so vulnerable – and not in a good way. It makes us weak. And stressed. And sick. mentally and physically. However, as soon as I made that connection – that I’m extremely competent at helping others with their pain but I wasn’t helping myself – the problem dissolved. I can do for myself what I do so easily for so many others. And, of course, so can you. I’ve been rabbiting on for a while about the gifts of this effing book. Despite the struggle, it is so worth it. There’s nothing like putting a body of work together to really help synthesize and clarify complex ideas. But to date, this gift of realizing how un-self-compassionate I was and, yet, how I can be self-compassionate, is the biggest gift of all. I don’t know if it sounds like a big deal to you, but it sure is for me. It’s a life-changer. So. What IS going on with that book, what’s it called … the 21 day myth, or something to do with habits? It’s still happening. You won’t find it on Amazon anymore, until it’s published that is. One of the Amazon disincentives for cancelling pre-orders is I’m banned from doing another pre-order for a year. But that’s okay. I can still publish and release books from Amazon anytime. Right now, I’m done with deadlines. Having said that, sooner is better than later and before October would be nice. I’m finishing the book as fast as I can while maintaining magnificent life-balance and lots of good ‘selfies’: self-forgiveness, self-compassion, and I’m even toying with self-love. It feels positively hedonistic. 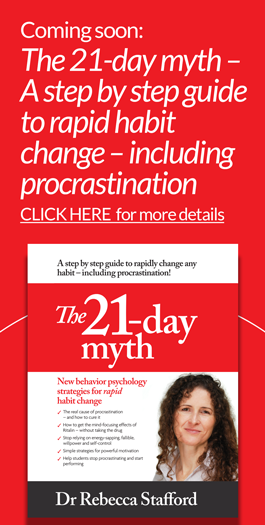 Should you be interested, I do have details of my soon-to-be-finished book ‘The 21-day myth: A step by step guide to rapid habit change – including procrastination!’ on a page on my website, which you can access here. Very best wishes with your own life projects. And please take excellent care of you – you’re the only one of you we have. Bring it! How I learned to be fearless – well, almost. If fear of criticism is stopping you doing … anything. Or even just slowing you down – then you may want to read this article. I discuss dealing with the bullies and the haters, and the worst hater of all. I’d LOVE to hear your constructive comments and have you contribute to the conversation. It would make SUCH a nice change from spam. You can access the comments section below. If you’ve found this article slightly useful, mildly entertaining, or just not too annoying, please consider sharing on social media with your loved ones. There are loads of social media icons floating around somewhere. Has some amazing person forwarded you this article? You can subscribe here. 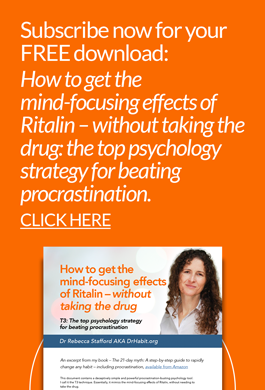 In addition to receiving … quirky newsletters with my latest news, goss and articles, you’ll receive a FREE download, How to get the mind-focusing effects of Ritalin without taking the drug – the top psychology strategy for beating procrastination. Hi Rebecca, As I was reading this I remembered reading Big Magic by Elizabeth Gilbert saying don’t do your creativity for anyone else but you. This book is about you and your healing and yes it will help a lot of other people as well but firstly it is your learning! So take your time and don’t worry about us! We will only reap the benefit of your process through writing this book. Sending you love and support! Honestly, I feel I’ve had (another) huge breakthrough – and doing this work, struggling through the swamp of despair, seems to be (unfortunately) the only way to get that gold.